If you follow me on social media, you know that I’ve been learning a lot from Carla Lalli Music’s new book, Where Cooking Begins. Carla’s mission is simple: get you to love cooking by teaching you how simple and rewarding it can be. I originally fell in love with Carla via her episodes on Bon Appetite’s youtube channel, so when she announced her book, I pounced on the pre-order. Instead of leading you blindly through her recipes, Carla equips you with digestible and doable techniques that will enable you to peruse any grocery store or farmers market for what catches your eye and cook it to perfection. I am already more confident to grocery shop without a specific recipe in mind. I initially read through her recipe for braised greens while I had some lovely beets sitting in my fridge. Could this recipe be adapted for beet greens? I decided to give it a try. Honestly, I wasn’t expecting much but holy moly, I scarfed them all down for lunch and have made it 3 more times since, with chard and collard greens. I’ve eaten them on their own, and also mixed it with a little bit of Italian sausage and lightly buttered pasta with Parmesan and black pepper. When it comes to grocery shopping, I love perusing the produce section—running my fingers through parsley, smelling the rind of a melon, or plucking the occasional grape for a taste test. But there aren’t many things get me as excited as seeing root veggies with their stems and leaves intact. Instead of lying life-less, scrubbed down and wrapped in plastic, you get to see these veggies with life still springing from them—dirt clinging to their roots, silt enshrouding their leaves and yes, the occasional bug or teeny weeny snail en tow. Well, the heart of this recipe lies in putting those greens to good use. And you can do this with just about any root veggie. Take carrots, for example: next time you see a bunch of carrots with their greens, take em home and make a pesto out of em to slather on a piece of meat as a marinade, as a sauce for pasta, or condiment for a turkey sandwich. You’re welcome. The backbone of this recipe are beet greens, but you could use chard, collard greens, or kale. What I love about using beets is that you get two dishes for one: beets (just douse them in olive oil and salt and pepper and roast at 450 until tender) and these lovely sautéed greens. The stalks are just as integral as the leaves. Just dice them up finely and start cooking them earlier so they have a chance to soften. I am using olive oil in this recipe, but you can also use whatever oil you like to cook with. The oil will to absorb flavor from the garlic and red pepper, so just use your go-to cooking oil. One of my favorite ways to enjoy garlic is roasted: when the spice of the cloves mellow out and they melt in your mouth like cotton candy. Since oil in this recipe carries the flavor of the garlic throughout the dish, we can leave the cloves whole, but lightly crushed. The cooking process renders them into little garlic pillows. Acidity lifts up and brightens the greens. I like to add lemon juice toward the end so it has a chance to impart its flavor but not cook entirely off so you get that tingle in the sides of your mouth with every bite. It also serves to deglaze the pan if if anything is starting to scorch. This is what brings the heat to this dish. It’s just enough to make your nose run a little bit and enjoy the flavor but not enough to make you regret your decisions. If you can’t handle the heat, tone it down or leave it out. Somewhat of an acquired taste, this is a wonderful (but optional) edition to finish this dish off after everything is done cooking. 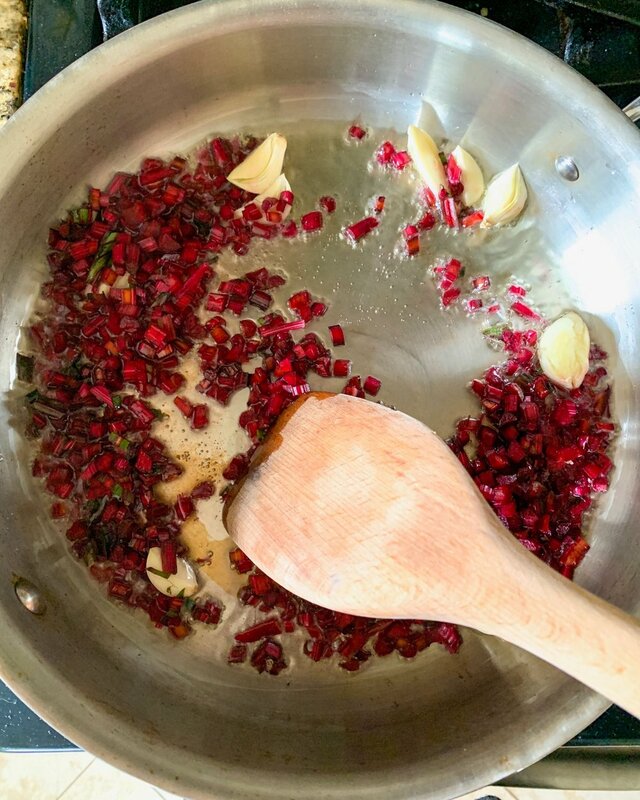 After you prep your ingredients, heat the oil in a sauté pan over medium heat until just shimmering and add your garlic and chopped beet stems. The goal is for them to soften, so if anything starts to brown, turn the heat down slightly and add a splash of lemon juice. After everything has softened up, add in the crushed red pepper and greens, cooking until everything is softened before adding more lemon juice a few minutes before everything is done cooking. These can beet greens can shine on their own (trust me I ate them all for lunch one day) or as a side to a roasted cut of meat. You can have them for breakfast with an over-easy egg on top, fold it in to some herbed cooked barley, or top it on your favorite pasta. This recipe turns something usually discarded into a lovely and versatile side dish. Prepare all of your ingredients. Remove stems from beet leaves and chop into 1/4" pieces. Tear leaves into bite sized chunks. Peel garlic and crush with the flat size of a chef's knife. Measure out your oil and spices and zest and juice a lemon. Heat 1/3c oil in a sauté pan over medium heat until shimmering. Add chopped stems and crushed garlic and cook until stems are softened, about 5 minutes. Add beet leaves, salt and crushed red pepper, continuing to cook until leaves are tender, 6-8 minutes more. A minute before it's done cooking, add lemon juice and cook till slightly reduced. Off-heat stir in whole grain mustard (optional) and season with more salt to taste. Serve and sprinkle with a little zested lemon. These can beet greens can shine on their own or as a side to a roasted cut of meat. You can have them for breakfast with an over-easy egg on top, fold it in to some herbed cooked barley, or top it on your favorite pasta. Beets are an under utilized vegetable and their greens fly even more under the radar. This recipe makes their greens a shining star with a slow sauté, punch of spice and dash of lemon. This mayo-free coleslaw is nutritious as heck, vegan, and it all comes together in 15 minutes. This crunchy side goes great with bbq meats, burgers, and sammies. Roasted broccoli is an incredibly easy side dish that can pair with just about any main dish. This Keto recipe uses a handful of ingredients, and will easily make its way into your weekly routine. Thank you! Be sure to check your email to confirm your email address and officially opt in.